Upcoming Oppo smartphones, R9 and R9 Plus, has been leaked by OnLeaks with retail box images which has confirmed most of the key specifications of these devices. According to the images these devices looks very similar to iPhone 6 in design, therefore Steve Hemmerstoffer has hashtag the tweet with #iPhone6Clone. These devices have already been leaked before when they got certification from TENAA website, but now these specifications are much more detailed and confirmed. 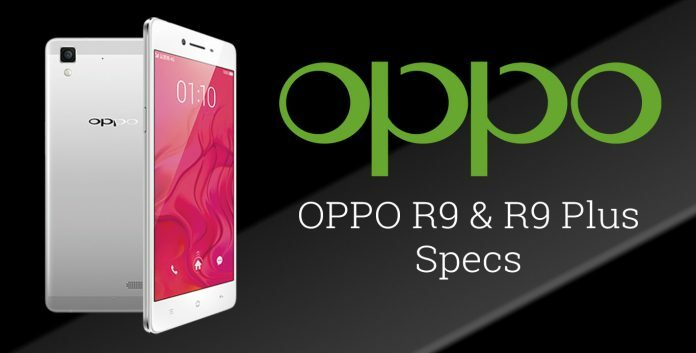 According to the images, Oppo R9 will feature a 5.5 inch AMOLED display while R9 Plus will have 6 inch display. Both will carry the same resolution of 1080 x 1920 pixels but R9 will have 401 pixels per inch while R9 plus will have 367 pixels per inch. Both these Oppo devices have fingerprint sensor and run on latest version of Color OS 3. R9 is mere 6.6mm thin while R9 Plus is 7.4mm thin. Both the devices are powered by 4GB RAM and has 64GB of internal storage, though R9 Plus also come in 128GB variant. R9 is backed with 2850mAh battery while R9 Plus has a bigger battery of 4120mAh. R9 has 16MP primary camera along with 13MP front camera, while R9 Plus sports 16MP camera on both side. Both the phone are 3G and 4G enabled and support fast charging. As of now, they are available in three colors, i.e. Pink, gold and White Silver. The official announcement of these phones will be made on 17th March along with their availability and pricing. To get updates on Oppo devices, stay tuned with us.